« First it was the mosque, now it’s Campbell’s soup! Kristian is an American-born Muslim student whose life was made a living hell by four bullies who called him a “f–in terrorist,” “f–in Muslim,” beating him whenever they could in his Staten Island public school. He father says, Kristian is now afraid to go outside alone. This is like a new kind of anti-semitism to Muslims, that erupted after the orchestrated crusade by Pamela Geller against the Muslim community center near Ground Zero. It also took place in a borough where Muslims were recently fought tooth and nail to terminate their plans of building a mosque described as another terrorism breading ground. This story happened around the time of the horrible Bronx gang torture of two teens and an adult because they were gay. Just as we try to create tolerance of homosexuality in schools and in the media, we should educate the public about understanding and respecting Muslims. Such school bullying didn’t come out of a vacuum. Our national media give a wide platform to people like Pamela Geller to spread lies and hateful rhetoric that has become the talking points even for politicians, turning Americans against Muslims in rallies across the country and culminating in hate crimes documented by the Department of Justice. 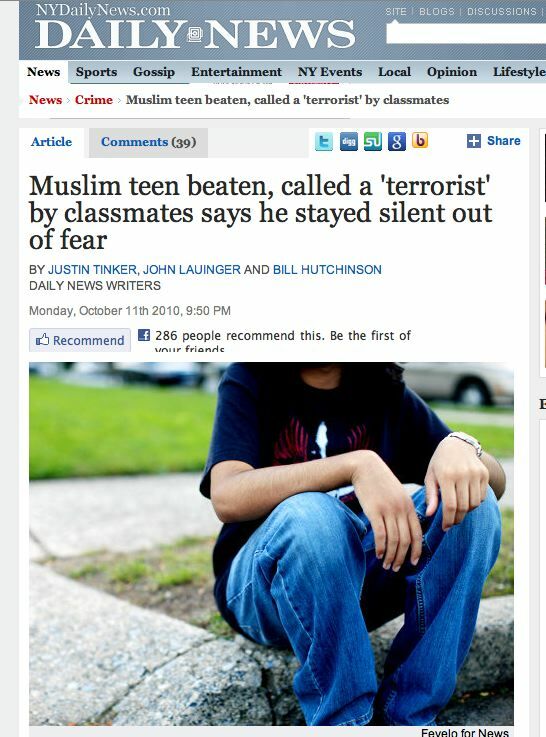 If our media continue to perpetuate such coverage, we are then endorsing and feeding a new kind of anti-semitism against Muslims, called Islamophobia… The New York Daily News should be applauded for publishing this horrible school bullying story. But instead of publishing it as a separate story, it would have been great putting it within the context of the anti-Islamic rhetoric we’re bombarded with daily across media channels. Perhaps that connection will awaken the sense of journalism ethics and responsibility when a TV station is ready to book somebody like Geller to take the pulpit calling for a new crusade against Islam.